Maia Makhateli, Principal with the Dutch (Het) National Ballet, was destined to become a dancer. She was born into a dance family with her brother a principal with The Royal Ballet, her father runs a ballet school in the USA and her grandfather was an acclaimed folk dancer in her home country of Georgia. At the age of sixteen Maia moved to the States with her family and joined the Colorado Ballet as the youngest dancer in the company. After five years with the company, she spent a year with the Birmingham Royal Ballet before finding her home with the Dutch National Ballet – where she started as a grand sujet in 2007 before being promoted to soloist and a year later to principal. Maia, coming from a distinguished dance family, did you feel you were destined to become a dancer? From the age of three I knew that I was going to become a dancer. For me dance was everything and I couldn’t imagine anything else as a small child. My parents danced, as well as my brother; my grandmother was an opera singer and my grandfather was a dancer. Unfortunately I didn’t see my grandfather dance because I was very young when he passed away, but he was a national folk dancer in Georgia and he even invented some elements of national folk dance. I was inspired by my brother, David Makhateli who trained and danced as a principal dancer with The Royal Ballet. So it’s probably genetic in the whole family! After moving to the USA you danced with the Colorado Ballet and briefly with the Birmingham Royal Ballet. When I joined the Colorado Ballet at the age of 16, I was the youngest dancer in the company. I worked there for almost five years and became a principal dancer. But I needed a change, because I knew that I needed to expand my horizons as a dancer and move to a bigger company. I had an offer from the Birmingham Royal Ballet to join the company as a soloist, but I hadn’t actually seen the city or the company before moving and unfortunately I didn’t find myself at home there. But I found my home in Amsterdam with the Dutch National Ballet, so I decided to move a year later. 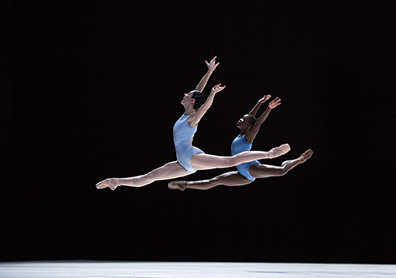 What drew you to the Dutch National Ballet? I knew about the Dutch National Ballet since I was young, because my brother used to work for the company. I first visited my brother at the Dutch National Ballet when I was 12, and again when I was in ballet school in Colorado. I fell in love with Amsterdam and the company, and on my way home to Georgia on the plane I said to my mum that ‘I want to live in Amsterdam one day’. So I took the chance to come to Amsterdam and audition, even though I wasn’t sure if I was going to get into the company, because I knew the company had very tall dancers and I’m not a tall dancer. But after the audition I had an offer. The Dutch National is one of the top companies in the world, can you share your experience with the company? What I like about the Dutch National Ballet is that the repertoire is very different – we do all the classics as well as lots of modern and contemporary dance, and we have a lot of famous choreographers who come to the company. I also get to work with lots of different people and that’s food for a dancer, which we need to grow and expand. Ballet is challenging and the lifestyle of a dancer is quite hard. You live to dance and you live in the theatre and everything surrounds dance. There’s a lot of sacrifices that have to be made for dance, but in the end it’s all worth it. What do you find the most satisfying? I love the feeling when I go on stage, being in a totally different world, that’s the satisfaction. It’s like an addiction – the more you go on stage, the more you want to do it. We spend quite a lot of time in the studio, which I love, but in the end when you go on stage it’s different. It feels different and it doesn’t matter if you’re tired or hurt, it’s like you forget everything. When you’re on stage you forget all the problems that you have in the world and you just enjoy your moment. Who inspires you in the dance world? Sylvie Guillem, I watched her a lot when I was young, she’s so beautiful and for me she was the ideal, and when I was young I wanted to be like her. Also Georgian prima ballerina Nina Ananiashvili was a big inspiration, because I grew up watching her dance and she’s a legendary woman. To grow and expand, to be better than I am. I want to be better than myself. I want to see how much further I can go – to go beyond my limits. What advice would you give to the young dancers? The most important thing is to love what you do, because when you put love into what you do, it really shows. You need determination and strength, and mentally you have to be very strong and you have to have a goal and never give up. Never give up on what you love. Ballet dancers are lucky because we get to do what we love. I wear Gaynor Minden – I went through a lot of different pointes, Grishko, Sancha, Freed, I tried them all, but I’ve been wearing Gaynor Minden for five or six years now.